Editor's Note: Terra Lawson-Remer is a Fellow at The Council on Foreign Relations and Assistant Professor at The New School. She was formerly Senior Advisor for International Affairs at the U.S. Department of the Treasury. 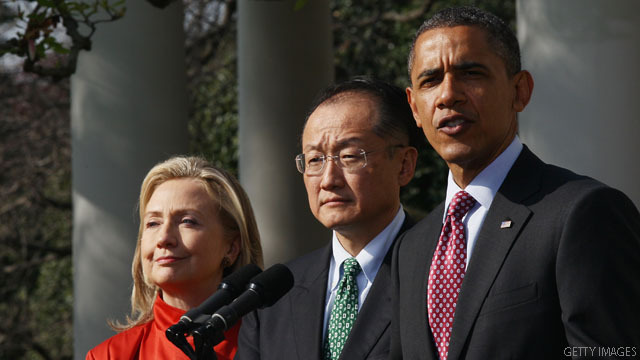 Obama's dark horse nominee for World Bank President-medical doctor, PhD anthropologist, Ivy League college professor, hip-hop impresario, and Dartmouth University President Jim Yong Kim (JYK) took many power-broker insiders by surprise. Instead, through Partners in Health, the NGO that he co-founded with Paul Farmer, Kim earned his chops forging a new paradigm in community-based health care that cost-effectively targets the root causes of diseases in the world's poorest countries. JYK will come to the Bank as a lifelong health specialist, educator, and visionary development practitioner. Human development outcomes like good health and education (called 'human capital' by economists) allow people to become productive workers and technological innovators. This drives economic growth and reduces poverty. As stated succinctly by the World Health Organization's 2001 Commission on Macroeconomics and Health, "Health is a priority goal in its own right, as well as a central input into economic development and poverty reduction. Increased investments in health would translate into hundreds of billions of dollars per year of increased income in the low-income countries." The country of Kim's birth, South Korea, is one of the most impressive economic development successes of the past fifty years. In 1960 South Korea's per capita income was just under US$1,800, about the same as Cote D'Ivoire and Sri Lanka. By 2008 its per capita GDP was over US$25,000, earning it entry into the OECD - the elite club for the world's richest countries. South Korea's astonishing economic success can be attributed in significant part to government policies that prioritized investments in health and education. In addition, JYK's approach to economic development reflects the cutting edge of development practice. Partners in Health prioritizes outcomes like lower HIV/AIDS infection rates, rather than inputs like dollars spent - embracing an evidence-based model to scale-up interventions that have measurable impacts. This approach has gained adherents from the Gates Foundation to MIT to the halls of the U.S. Congress. Historically the World Bank has assessed staff performance based on the number of loan agreements signed and the amount of money disbursed. In an era of increasingly constrained resources, Kim's focus on results is more important than ever. At the same time, Kim's work places the power to shape development interventions in the hands of the intended beneficiaries themselves, which builds capacity and ensures accountability. His community-based approach entails piloting locally embedded projects, collaborating with civil society, taking account of local conditions, and responding to homegrown knowledge. Tackling poverty from the bottom-up addresses the accountability deficit that has long haunted the aid community, creating built-in feedback mechanisms to ensure projects are meeting the needs of the poor. The World Bank has already begun to embrace a more community-empowered framework. Under Kim's leadership this important new direction could develop sustainable roots. Kim's long experience as an educator will also serve him well. Countries across the Middle East, North Africa, and Asia are now struggling to capitalize on the potential demographic dividend generated by their large populations of young people. Yet if graduates face unemployment rather than opportunity, this dividend will be squandered, sowing the seeds of discontent and stagnation. Ensuring that young people now entering the workforce have the skills they need to match the jobs emerging in dynamic sectors is a critical challenge that Kim is ready to meet. Most compellingly, Kim has focused his entire life's work on meeting the needs of the poorest and most vulnerable. Aggregate economic growth can sometimes raise the yachts while swamping the dinghies. The views expressed in this article are solely those of Terra Lawson-Remer. fair! thought there were three top contenders? hope you do same for the other two candidates! Yes, it's a good pick! ( وَلَقَدْ كَرَّمْنَا بَنِي آدَمَ وَحَمَلْنَاهُمْ فِي الْبَرِّ وَالْبَحْرِ وَرَزَقْنَاهُم مِّنَ الطَّيِّبَاتِ وَفَضَّلْنَاهُمْ عَلَى كَثِيرٍ مِّمَّنْ خَلَقْنَا تَفْضِيلاً ) . وعن سيدتنا عائشة رضي الله عنها أن رسول – صلى الله عليه وسلم – قال : (( إن كسر عظم المؤمن ميتاً مثل كسره حياً )) , قال السيوطي في بيان سبب الحديث عن جابر قال : خرجنا مع رسول الله صلى الله عليه وسلم في جنازة ، فجلس النبي صلى الله عليه وسلم على شفير القبر وجلسنا معه ، فأخرج الحفار عظماً ساقاً أو عضداً ، فذهب ليكسره، فقال النبي صلى الله عليه وسلم : ( لا تكسرها ، فإن كسرك إياه ميتاً ككسرك إياه حياً ) . وعن أبي هريرة – رضي الله عنه – قال : قال رسول الله – صلى الله عليه وسلم – : (( لأن يجلس أحدكم على جمرة فتحرق ثيابه ، فتخلص إلى جلده ، خير له من أن يجلس على قبر مسلم )) . هذا هو الحكم الشرعي لمن يتجاوز على قبر المسلم ، فكيف بالذي يعمد على نبش قبره ؟. لذلك إن ما قررته الشريعة الاسلامية أن الإنسان مخلوق مكرم حيا وميتا , وثبت الإجماع على عدم جواز نبش قبور المسلمين وإخراج الموتى منها إذا بقي من أثرهم شيء حفاظا على كرامة الميّت وحرمته. هذا هو يومكم الذي يجب أن تعلنوا فيه عن موقفكم الشرعي والوطني والأخلاقي . علماء الشريعة الاسلامية عليهم واجب أمام الله أولاً ، ثم بعد ذلك أمام المسلمين الذين يعملون بما تقرره الشريعة الاسلامية ، وينطق به العلماء . شيوخ العشائر هم من يسمع منهم أبناء عشائرهم كلمة الحق ، والتي تمثل شيم الرجال ، وموروث العشائر العربية ، لذلك عليهم واجب أخلاقي ينتظر أبناء عشائرهم أن يسمعوا ما يمثل ذلك . أما رجال المقاومة الوطنية والقومية والاسلامية الأبطال فهم من يضع الحق بمكانه للتعبير عن موقفهم الشرعي والوطني من خلال العمل العسكري المباشر ضد كل من يساهم في التجاوز على قبر الشهيد صدام حسين . اصدروا فتاواكم يا علماء الشريعة الاسلامية في العراق بتحريم نبش القبور ، وإذا لم نسمع منكم ذلك فسوف يحاسبكم الله في قبوركم ، ويسلط عليها من ينبشها لأنكم رضيتم بما يريد أن يفعله السفهاء وسكتم عليه على الرغم من أنكم تعلمون ما هو الحق ، ومن يسكت على باطل فإنه ينتظر ذلك الباطل يسلط عليه . قولوا كلمة الرجال يا شيوخ القبائل العربية ، لأن من اختاركم لهذه المكانة كان يتأمل بكم موقف شجاع عندما يريد الباطل أن يسود ، فإن لم تقولوا كلمة تردع هؤلاء الرعاء ، وتفعلوا ما يردهم في مواجهة هذه الجريمة التي لم ترضى بها العرب ، وهي من أساليب الفرس الذين تربوا على الغدر والحقد ، فلن تجدوا من يحترمكم بعد ذلك حتى من أبناء عشائركم . أما أنتم يا رجال المقاومة الأبطال فاعلموا أن النبي صلى الله عليه وسلم قال : "من حرق حرقناه ومن غرق غرقناه ومن نبش قطعناه" . فمن واجبكم الشرعي والوطني قطع يد من يريد أن يعبث بقبر الشهيد صدام حسين ، وقبور غيره من الشهداء ... اعلنوا هذا القرار من الآن وقولوا ( لقد أعذر من أنذر )، وفي حالة تورط أي من منتسبي الجيش والشرطة بمثل هذه الجريمة فسوف يكون ذلك حل لكم من التزامكم من عدم استهداف منتسبي الجيش والشرطة لأنهم تجاوزوا حتى على الأموات بعد أن كانوا قد تجاوزوا على الأحياء ، وأعلنوا بعد ذلك أن مراكز الشرطة ، وتجمعات الجيش ستكون أهداف لكم بسبب قيامهم بالمشاركة بهذه الجريمة ، من أجل ردع من يحاول أن يتورط بمثل هذا العمل الجبناء . نحن نخاطبكم وننتظر أفعالكم التي تفرح الصديق وتغيظ وترهب العدو والله ناصركم . World bank should be shut down promptly...an obsolete heavily politicized concept that has served its purpose. If you look at the employee demographics you will see why. BTW Mr. Kim should be promoted and sent to Afghanistan as ambassador with the mandate to promote literacy there and set up some Ivy league satellite campuses in Kabul and Kandahar. yeah I think he should be sent to afghanistan as ambassador with the mandate to promote literacy there. Can't say that I'm not disappointed. Congrats to Mr. Kim but I thought Ms. Okonjo-Iweala was going to be chosen for the job. This would have been HUGE for Nigeria and other non-American/European nations around the world. Oh well....hopefully Dr. Kim does a good job.